Joy & happiness that is what my life involves all the time and especially on wedding days. When you are commissioned and honored to capture a clients wedding you try to represent that in your art. You see documenting someone day takes lots of knowledge, experience, and being very assertive. Your documenting this wedding for your clients, that said clients has many family and friends attending this beautiful day, and everyone has a big part of this magical day. I hardly ever take any breaks only when the clients at the reception says to me, please grab something to eat. Even then, I am usually done eating is less then 6 to 8 minutes, why? Because this day is not at all about me, this day is about me doing what I do best, being a fly on the wall and documenting the emotional reaction from everyone. Here is a great example that I captured at Palmetto Dunes wedding venue. Children at a wedding are very fun to capture, they have some of the best expressions. While the bride and groom were cutting the cake, children favorite part of the wedding, as I always have both of my eyes open even when I am capturing an image, a talent I develop to be aware of the entire surrounding so that I do not miss a fantastic photo, I noticed the two little precious flower girls having such a fun moment. As I panned and they did not even realize I was doing this, I quickly waited for that one moment that would freeze that joyous time. 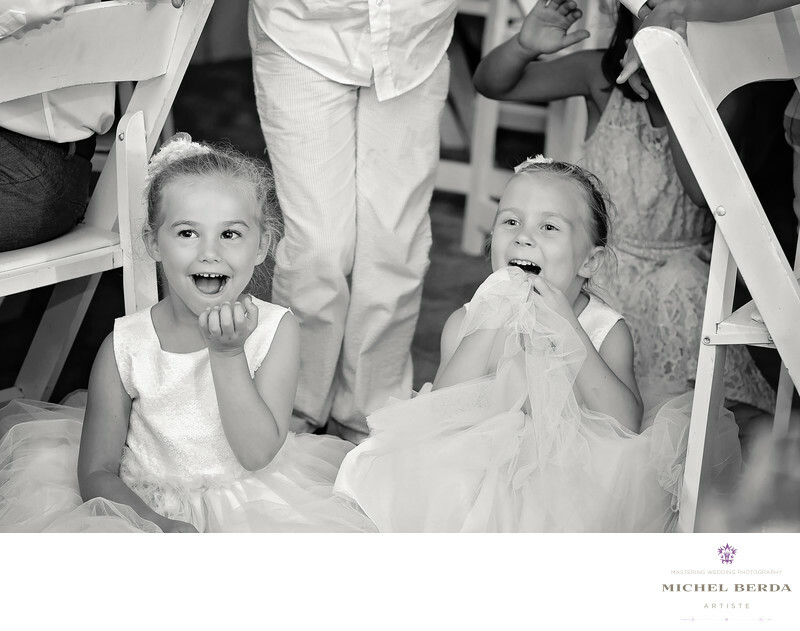 The image captured at Palmetto Dunes wedding venue of these flower girls in B&W is perfect and well documented, I am very sure this frozen moment will be cherished by everyone for many years to come, exactly why I love my passion for the art and every wedding I am honored to capture.